I started in July of 2011, so just over a year and a half. Currently, I’m a stay-at-home mom, but by trade I’m a project manager in the Advertising industry. My cousin had just joined and talked me into trying it out – I was hooked immediately! What was your first thought when you walked in the door? Honestly, I was totally intimidated, but after trying the free workout, I felt so out of shape that I knew I needed to join to kick my fitness into high gear. I’m definitely a more fit person, physically, and I feel stronger than I ever have before. The best part for me though is I am able to keep up with my kids – they are active and have A LOT of energy! Mentally, I have a much clearer head. For me, it’s definitely mental – if I don’t have my head in the game, I do poorly that day. I like that CrossFit brings your weaknesses to the surface so you have to overcome them – it is an empowering feeling when you actually get there. How was your experience doing CrossFIt while pregnant? Amazing – seriously, the best decision ever for me! With my first two pregnancies, I did yoga and it was great. With my third, I was already committed to CrossFit and I didn’t want to give it up. 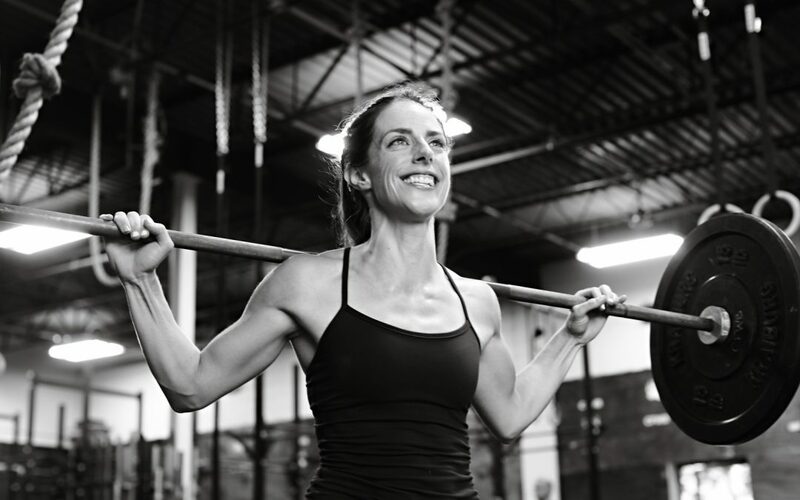 I continued to do CrossFit during my entire pregnancy and never felt stronger. Doing CrossFit really limited my aches and pains during pregnancy, I slept great and never really lost much strength. With the help of all the CrossFit White Bear trainers, I was able to adjust and scale the movements to accommodate my changing body. Again, amazing. My recovery was so speedy and I felt like a million bucks just a few weeks after having my daughter. I was back to CrossFit within a few months. Any words of advice for mommies to be? If you are active prior to pregnancy, stick with it! Be open and honest with your doctor, your trainers and yourself. Go with how you feel and what you can handle – you know your body best. Staying active not only helped me feel good throughout my pregnancy and allowed me to keep up with my busy toddlers, but it really helped me bounce back after labor and has made me feel like myself again! What is your favorite movement and least favorite movement or WOD? I’d have to say my favorite movement is the back squat! I also really like push-ups! As for least favorite, I am not a huge fan of burpees, but really, who is?!? When I first walked in the door, I liked that it was a “nuts and bolts” type place, no frills, just the elements you need to get fit. I still like that aspect of CrossFit, but my favorite thing has to be the amazing people I have met along the way. Every member here has a common goal towards being active and fit and we are all there to support each other. The friendly competitive spirit amongst this group is fantastic and inspiring! What goals have you achieved? How did CrossFit help? CrossFit has helped me to not only become a stronger person physically, but an all around happier person. I have found the “thing” that I needed for myself by joining CrossFit. Making it through a WOD or completing a heavy lift gives me a greater sense of self. I no longer doubt myself – if I put my mind to something, I know I can achieve it! How can other people relate to your story or any words for people who might want to try but are intimidated? I’m just a 30-something mom trying to get through each day a little easier. If I can do CrossFit, anyone can! Before you say you don’t think you could do it – give it a whirl! Not only will you be amazed by what your mind and body can endure, you’ll get hooked!